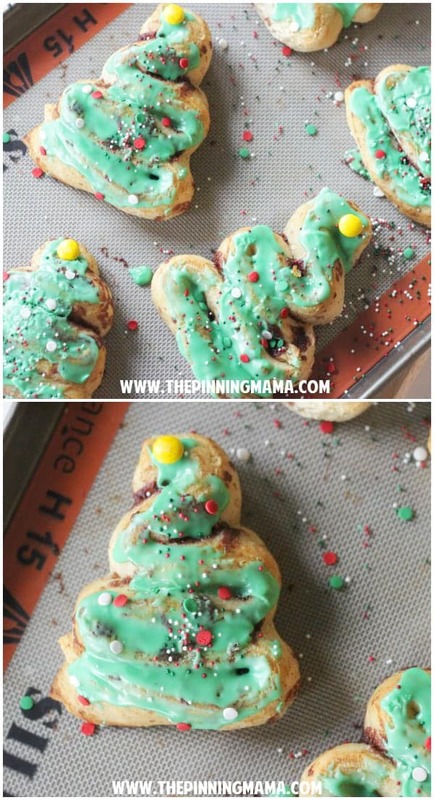 Make these fun Christmas trees for a holiday breakfast using just Pillsbury Grands Cinnamon Rolls, green food coloring and a few M&M’s and sprinkles! My family doesn’t just like Pillsbury cinnamon rolls… they LOVE them. My kids are pretty little, but despite their size they can down like 5 cinnamon rolls each…. if I would let them. I usually cut them off at three but it still boggles my mind that with my little family I am on the verge of needing to cook three tubes of them just to feed all of us breakfast. Since they love them so much I have had a lot of fun over the past year making them into fun breakfast treats. 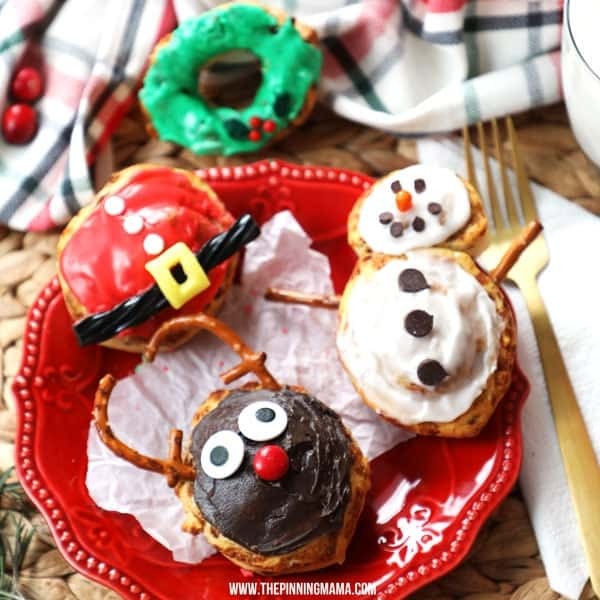 We have more Christmas ideas like these Cinnamon Roll Reindeer, and Cinnamon Roll Snowman. Or see all 5 of my easy christmas breakfast ideas here! We didn’t have any special cinnamon rolls for Christmas though, so this year we had to change that! These cinnamon roll Christmas trees were fantastic! They are adorable and super easy and because you make them with Pillsbury Grands they are giant and gooey, otherwise known as my favorite kind of cinnamon rolls! These are probably my favorite cinnamon roll creation yet and it makes for a perfect breakfast treat leading up to Christmas or on Christmas Eve or even during the break from opening presents on Christmas Morning! We love to make these with the kids and also serve this more traditional breakfast casserole. To make these up quickly, all you need is 4 simple things: Pillsbury Grands Cinnamon Rolls, green food coloring, 5 yellow M&Ms or candies of your choice, and assorted Christmas sprinkles- I used a Wilton multi pack . To be VERY clear you need to use Pillsbury Grands cinnamon rolls. The regular cinnamon rolls won’t work because they are more of a round biscuit with cinnamon where as the Grands are a long piece of dough rolled up into a cinnamon roll. This is very important since we need to unroll that long piece of dough to form the tree. A helpful hint for making these is to make sure the cinnamon rolls are straight out of the fridge when you go to make the Christmas trees. If they have been sitting out and getting warm I have found that it is much harder to get it to form easily. So to begin at the beginning, pop open your tube, take out the icing tin, and then separate your 5 rolls. Use a large cookie sheet and start by unrolling the first roll. Then start by forming the bottom of the tree by making about a 2 -2.5″ line with the dough before curving it up as shown in the picture below, to make the next row on the tree. Continue to make each row of the tree by curing the dough up and making a line a bit shorter than the one below it, until you run out of dough. Repeat this with the remaining 4 rolls spaced out evenly on the cookie sheet. Bake as directed on package and remove when they are done through and just barely browned on top. While the rolls are baking, mix the icing with a couple of drops of green food coloring until it reaches your favorite shade of green. Once the cinnamon rolls are done, let them cool for about 3-5 minutes, then spread an equal amount of the green frosting evenly over the top of each roll. Immediately, while the icing is still wet, sprinkle on any and all of your Christmas sprinkles. Finish with the yellow M&M as the star on top. Serve while they are all warm and gooey, which is my favorite way, or you can let them cool then wrap them up and bring them to friends, neighbors and teachers. I did this at my daughter’s school (mainly so I didn’t eat all of them after making this post) and they were a HUGE hit with the teachers! Because this is such a simple and fun breakfast idea, it is also perfect for the kids to help with. I hope you have the Merriest of Christmases and a wonderful new year!! Open the cinnamon roll tube and separate out the icing and the rolls. Unroll your first roll and shape into a tree by starting at the base of the tree and making a 2-2.5" line of dough and then curving it up to make the next row slightly smaller, and repeating until your dough is gone. While the rolls bake, mix the food coloring into the icing. Remove the cinnamon rolls from the oven once they are done and let cool 3-5 minutes. Spread the green icing evenly over the top each row then sprinkle with the sprinkles then place the yellow M&M on top. I loooove this idea!! Can’t wait to use it for Christmas!! Great idea!! However, I won’t lie… these actually remind me of the poop emoji hahah. I do love cinnamon rolls, mmmm. They would make a great April fools breakfast, with brown frosting. Haha! Just made these as part of my gift bags to the mailman and other service workers as I’ve done for 25 years. They were easy to do. I agree the colder the dough the better it works. I don’t know how to share a photo of mine or I would. Thanks for sharing. Merry Christmas! Cinnimon grands have been our traditional Christmas morning treat. Can’t wait to make these trees! Great idea! Ok thanks!!! I hope the kids love them they look fun!! My 12 year old granddaughter is going to make these for Christmas! She is a good cook for her age so can’t wait to taste them!!!!! 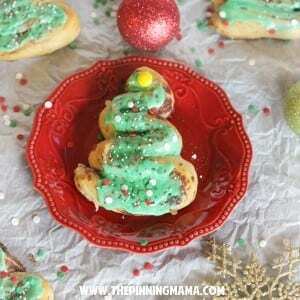 These little trees are adorable and perfect for Christmas morning! I love how you’ve taken something simple and made it special! These are absolutely adorable and make me wish I would have some kids around on Christmas morning to make them for! Such a cute way to make rolls more Christmas-y! !